[S568] David Paulsen, "Abel Humphrey," e-mail to James H. Holcombe, 14 June 2005. Abel and Julia were enumerated in the 1850 Auburn, Cayuga Co., NY, federal census. He was a laborer, age 45, she was 45. Children in the household were Roenia 19, a female 18, Ellen 16, Sarah 14, Emeline 12, LaFayette 10, David 7, and Abel 5. Abel and Julia were enumerated in the 1860 Auburn, Cayuga Co., NY, federal census. He was a Sawyer, age 55, she was 55. Children in the household were Ellen 25, Emeline 19, and Abel 14. Abel and Julia were enumerated in the 1870 Waterville, Pepin Co., WI federal census. He was a farmer age 65, she was 66. Children in the household were Lafayette 28, and David 26. Augustus and Chloe were enumerated in the 1850 Holland, Orleans Co., VT, federal census. He was a farmer, age 43, she was 43. Children in the household were Abel R. 17, Rufus 15, James 12, and Philena 7. C.G. and Adeline were enumerated in the 1860 Muscatine, Muscatine Co., IA, federal census. He was a lawyer, age 30, she was 17. The only child in the household was Fanny F. 6 months. Also in the household was Gordon Hays a Cong. 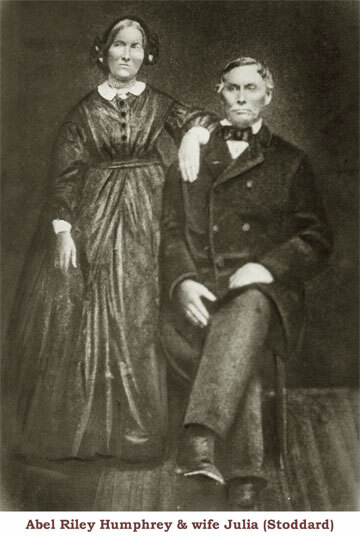 Minister, age 62, and Mary D. Hays 60. [S25] Hannah McPherson, Holcombe Genealogy, Page 146.2, Item A-8-1-5-1-5-9-1. George and Ada were enumerated in the 1860 Galesburg, Knox, Co., IL, federal census. He was a college professor, age 31, she was 28. Children in the household were Milton 4, and Mary 4 months. Also in the household was D. Hays, 18, a student, apparently Adeline's brother, Daniel. George and Ellen were enumerated in the 1870 Galesburg, Knox Co., IL, federal census. He was a teacher, age 41, she was 29 born in IL. Children in the household were Milton 13, Charles 7, Nellie 5, and George 4. George and Ellen were enumerated in the 1880 Galesburg, Knox Co., IL, federal census. He was a teacher, age 50, she was 39. Children in the household were Milton A. 28, Charles E. 17, George 14, step-daughter Nella S. Waltziner 15, and son William D. 3. Apparently before 1870 Adeline died and George married Mrs. Ellen Waltzner, who had a daughter Nella S. This would have occurred after the births of Nella and George,and after the birth and death of daughter Fanny; so the marriage would have occurred 1867-1870. [S25] Hannah McPherson, Holcombe Genealogy, Page 146.2, Item A-8-1-5-1-5-9-2. W.P. and Mary E. were enumerated in the 1880 Evanston, Cook Co., IL, federal census. He was an editor, age 49, she was 46. Children in the household were Lydia, 20, and William 18. Mary was Lady Principal of N. W. female college (later Woman's college of Northwestern University, Evanston, IL 1855-1862). William was US. Consul at Macao, Amoy and Canton, China 1862-63. President of Northwestern University in 1883; Associate Editor, Chicago Inter-Ocean. [S25] Hannah McPherson, Holcombe Genealogy, Page 146.2, Item A-8-1-5-1-5-9-3. [S25] Hannah McPherson, Holcombe Genealogy, page 146.2. Edward was a lawyer and stock-reeder, Red Oak, IA. He studied at Yale University to junior year, class of 1857. John and Kate were enumerated in the 1880 Red Oak, Montgomery Co., IA, federal census. He was in real estate, age 42, she was 31. Children in the household were Carleton 5, and Mary 2. Living next door were Kate's parents Samuel C. and Sarah. [S137] Elisha Scott Loomis, Joseph Loomis, Page 467, item 9736. Daniel graduated from Knox College in Galesburgh, IL, in 1863; was a breeder of hourses and real estate agent at Low Run Stock Farm. Daniel and Alice were enumerated in the 1900 Muscatine, Muscatine Co., IA, federal census. He was 57, she was 56. Children in the household were Mary 22, Katherine A. 19, Alice W. 17, and Daniel Jr. 14. [S25] Hannah McPherson, Holcombe Genealogy, page 147.1. Children of Lydia Maria Hayes and Rev. James Walter Waugh D.D. Ada was probably the daughter of L. H. and Catherine Stone, recorded in the 1850 Muscatine, Muscatine Co., IA, federal census. She was listed as age 7. [S25] Hannah McPherson, Holcombe Genealogy, Page 146.2, Item A-8-1-5-1-5-9-1-1. Norman Churchill married Anna Eggleston. Anna Eggleston married Norman Churchill. Joel Valentine Hollebaugh married Ann Rebecca Hergesheimer. Ann Rebecca Hergesheimer married Joel Valentine Hollebaugh. Fred Fischer married Minnie Fobian. Minnie Fobian married Fred Fischer. Private Lyle E. Coonrod was a member of the 47th Infantry, 9th Division, and is buried in the Netherlands. Elmer Coonrod was born circa 1889 at IL.1,2 He married Ellen Lott in 1911. [S704] Clarence Lott, "Albert Elmer Coonrod," e-mail to James Hallowell Holcombe, 6 November 2009. Ellen Lott was born in March 1891 at NE.1,2,3 She married Elmer Coonrod in 1911. Elmer A. and Ellen were enumerated in the 1930 Como, Hand Co., SD, federal census. He was a farmer, age 40, she was 39. Children in the household were Loretta E. 17, and Lyle E. 8.